It’s been awhile, but I’m back for another fun announcement. As you are probably painfully aware, 2016 came and went without a Super Mega Awesome Bottle Release Day. It wasn’t for lack of wanting on our part, but rather lack of beer. The good news is we have a pair of beers from our barrel program ready now that we are extremely excited about, along with the next two releases from Ghost Pixel series… just enough to make a Mini Awesome Bottle & Can Release Day! Here’s a summary, with specific details below that. 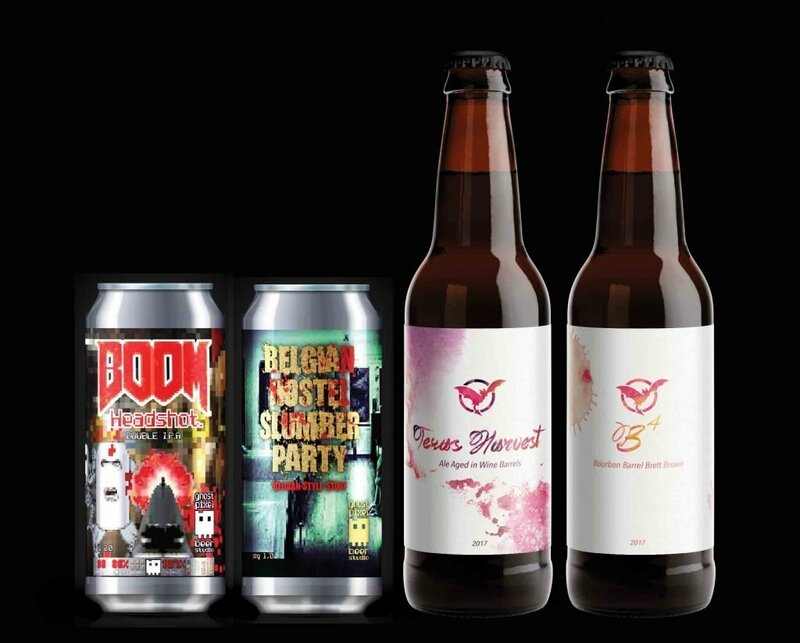 What beers: Texas Harvest, B^4, Ghost Pixel BOOM Headshot., Ghost Pixel Belgian Hostel Slumber Party. First let’s talk about the beers, and then we’ll get into the logistics of release day. BOOM Headshot., fps v. 2.0 is the first iteration in what we hopes will be a continuously evolving Double IPA. Brewed with Summit and Sorachi Ace early in the boil along with generous late additions of Rakau and Motueka Hops, BOOM is highlighted by notes of freshly crushed citrus, pineapple, and resinous pine needle. The name is nod to what has become one of gaming’s most popular styles, First Person Shooters, to go with what is undoubtedly craft beer’s most popular: IPA. 7.8%, 60 IBU. 240 4-packs available. $9/4-pack of 16oz cans. Slumber Party will be our series of stouts, an ode to the Survival Horror Genre of games that really came to the forefront with classic titles like Castlevania, Splatterhouse and Sweet Home and went full mainstream with Resident Evil dropped in the mid-90s. Dark, rich chocolate and deep roasted tones are present with pleasant fruit and spicy esters from our house Belgian-yeast strain. 7.2% ABV, 30 IBU. 240 4-packs available. $9/4-pack of 16oz cans. And now let’s talk about the release. This will be a non-ticketed release event, and wristbands will be handed out starting at 8am when doors open on a first-come, first-serve basis. We will, as usual, be hosting a bottle share starting when doors open. Please note, the bottle share is for release attendees and customers… not campers looking to score some free Whalez. We provide you a space to hang out and have a good time, and we ask you please not abuse our generosity. You know who I’m talking about. We will have the beers on tap and will have sorted out a mechanism for easier ordering. We don’t know what that is yet… but we’ll be trying something new to make things better. We will start selling bottles and cans at 9am, and we will allow the bottle share to go on until 10:30am. By 11:30am, we will ask everyone to have cleared out so that we can clean up and re-open at noon. More details to come in regards to final counts for the Ghost Pixel releases, pricing, and limits. Hit us up on Facebook or Twitter if you have any questions!